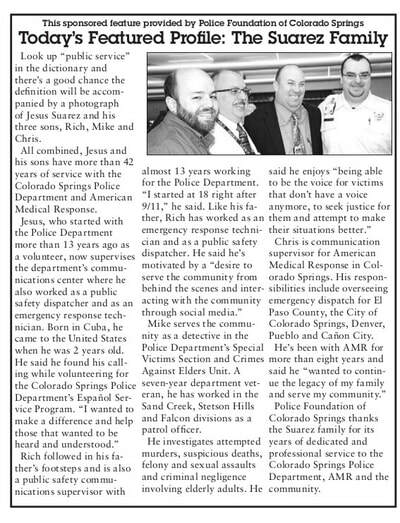 The Suarez Family has a long and proud history serving the Colorado Springs community while contributing to public safety. This profile appeared Jan. 14, 2015. Shelley Weber is a retired Colorado Springs police officer who just could not stay away from law enforcement. This profile appeared Jan. 28, 2015. 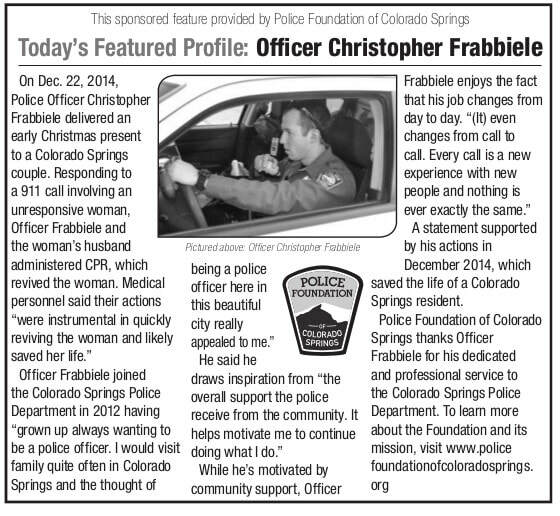 Officer Christopher Frabbiele delivered an early Christmas present to a Colorado Springs couple in December 2014. This profile appeared Feb. 11, 2015. Officer Allison Detwiler relied on years of law enforcement experience to deal with a potentially deadly situation in May 2014. Her incredible actions resulted in the award of the Medal of Honor in November 2014. This profile appeared Feb. 25, 2015. Aaron Bellingham has seen the handwriting on the wall and it's keeping him very busy. This profile appeared March 11, 2015. Sgt. 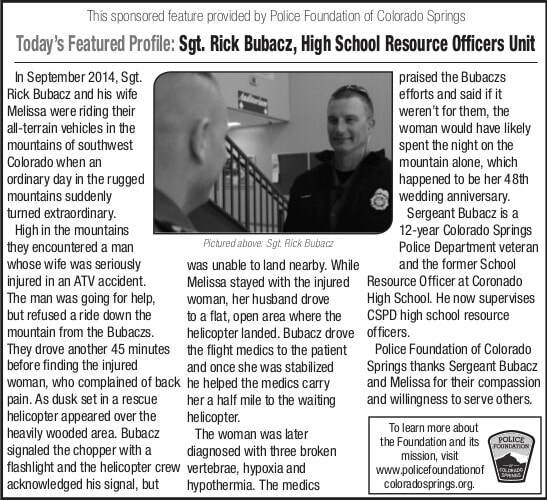 Rick Bubacz and his wife Melissa were enjoying a day of four wheeling in southwest Colorado when an ordinary day in the wilderness turned extraordinary. This profile appeared March 25, 2015. Mari Dennis has seen people at their best and at their worst. 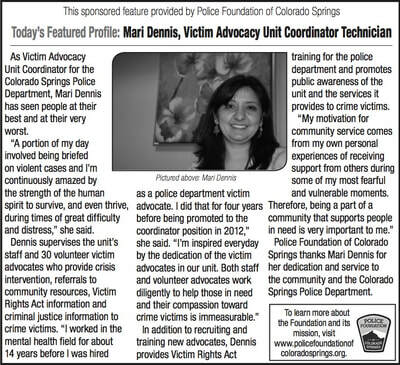 She manages the police department's victim advocacy unit, which serves people in their greatest time of need. This profile appeared April 8, 2015. Officer Vijay Seenath has law enforcement experience on both sides of the Atlantic Ocean, which gives him a unique perspective of policing. This profile appeared April 22, 2015. 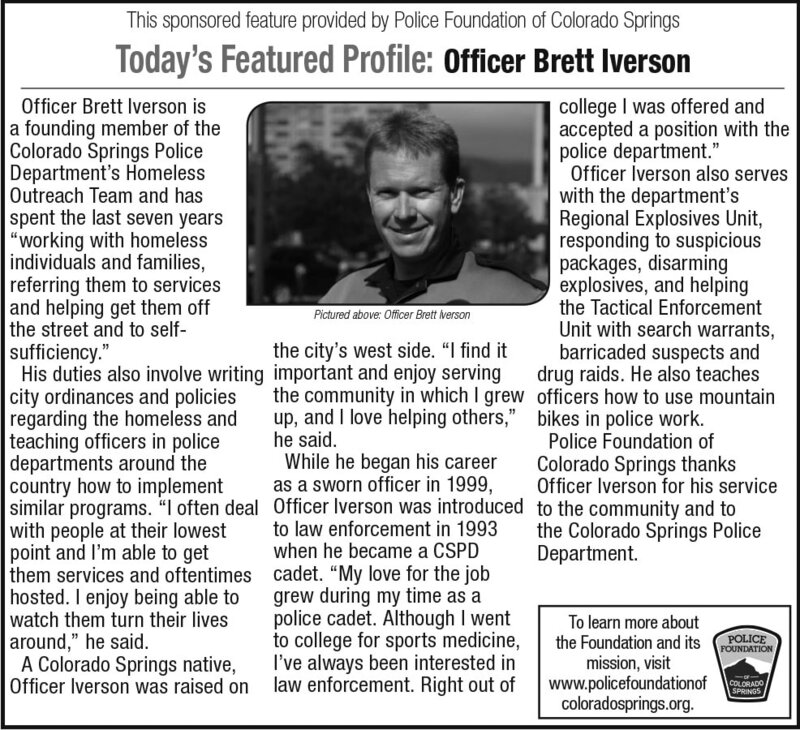 Officer Todd Murray thrives on physical challenges, which is why he's completed multiple Leadville Trail 100-mile mountain bike races, the Leadville Trail 100-mile run and the Hawaiian Ironman Triathlon. This profile appeared May 6, 2015. Sgt. 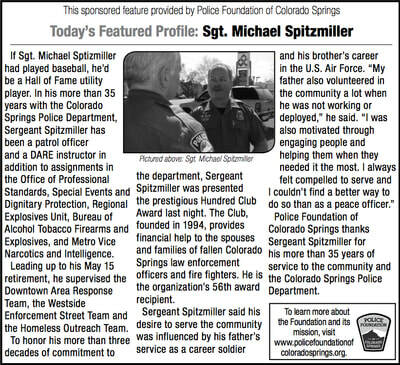 Mike Spitzmiller served the Colorado Springs Police Department and the community for more than 35 years. 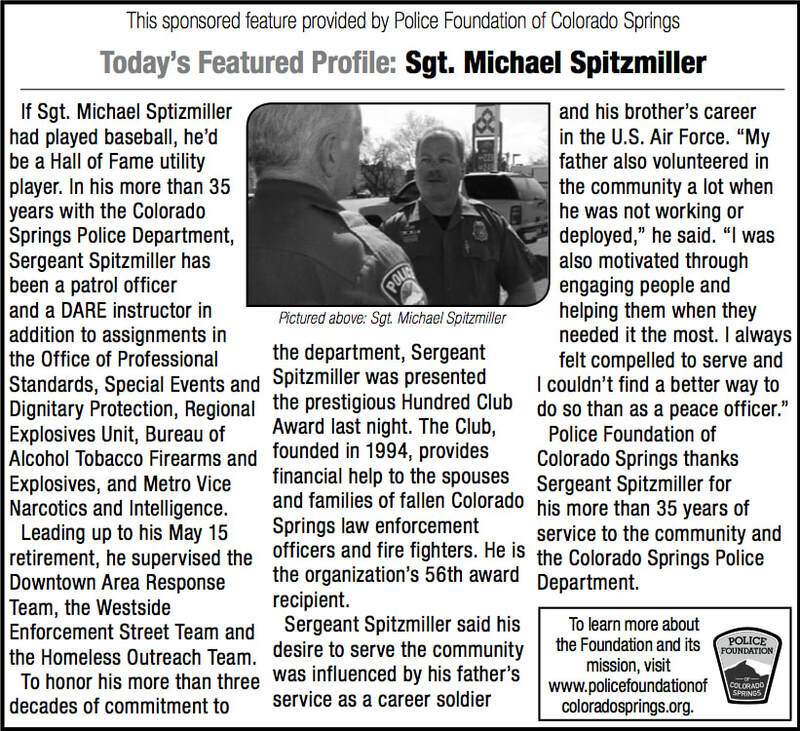 Following his May 15, 2015 retirement, Spitzmiller became the 56th recipient of the Hundred Club Award. This profile appeared May 20, 2015. Detective Jill Wohlbach finds enormous personal satisfaction in serving her community not only as a police officer, but as a volunteer with the El Paso County Search and Rescue team. This profile appeared June 3, 2015. 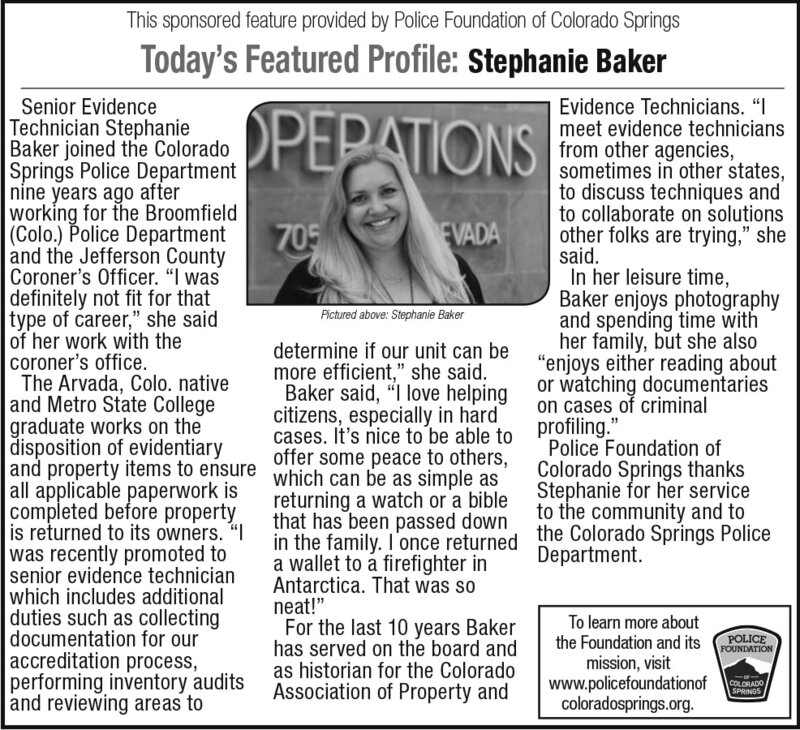 Brenda McQuatters, the Colorado Springs Police Department's skilled maintenance supervisor, keeps the department's 11 buildings up and running to ensure police officers and other staff can do their jobs. This profile appeared June 17, 2015. Detective Katie Benoit swam the English Channel and also has completed some incredible long-distance swims, but one of her most impressive accomplishments in the water happened in landlocked Colorado Springs. This profile appeared July 1, 2015. 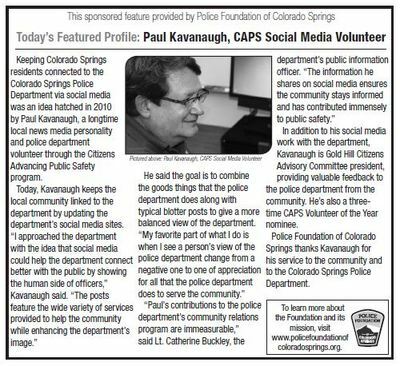 Paul Kavanaugh keeps the Colorado Springs Police Department connected to the community through social media. He volunteers his time through the Citizens Advancing Public Safety program. This profile appreared July 15, 2015. 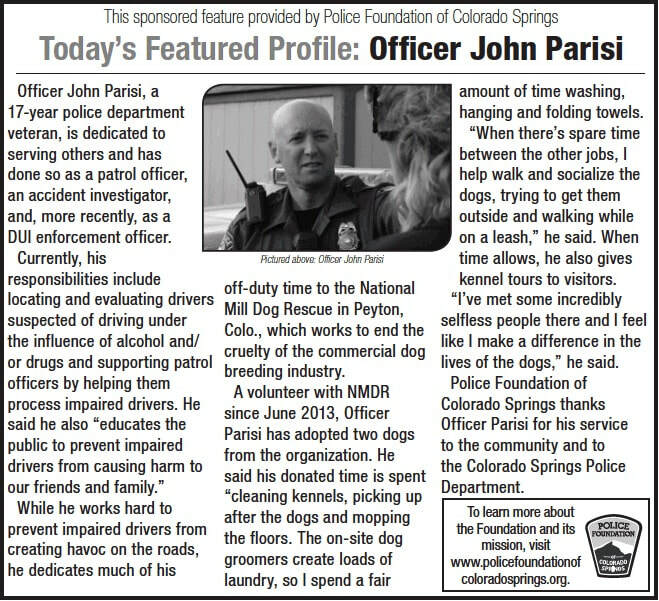 Officer John Parisi works hard to prevent impaired drivers from creating havoc on the roads, but he also dedicates much of his off-duty time to the National Mill Dog Rescue in Peyton, Colo. This profile appeared July 29, 2015. Detective Jennifer Pitt loves pursuing predators on land and in the water. 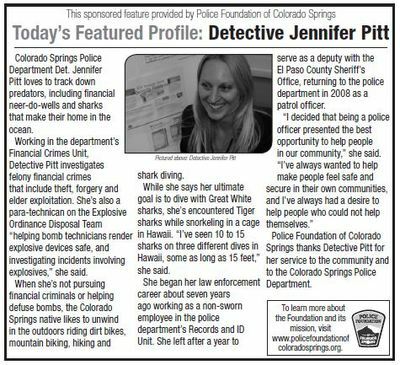 Learn more about this financial crimes detective and her penchant for diving with sharks. This profile appeared Aug. 12, 2015. 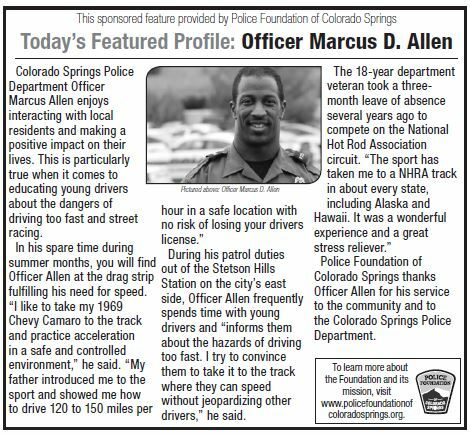 Officer Marcus Allen spends much of his time working with youthful drivers who like to drive fast. His love of fast cars makes it easy for him to relate to them. This profile appeared Aug. 26, 2015. 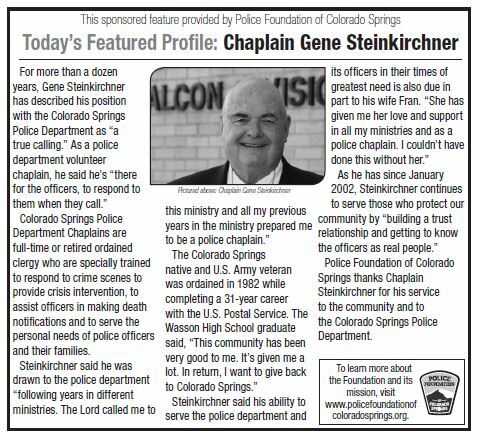 Chaplain Gene Steinkirchner describes his volunteer position with the Colorado Springs Police Department as "as true calling." 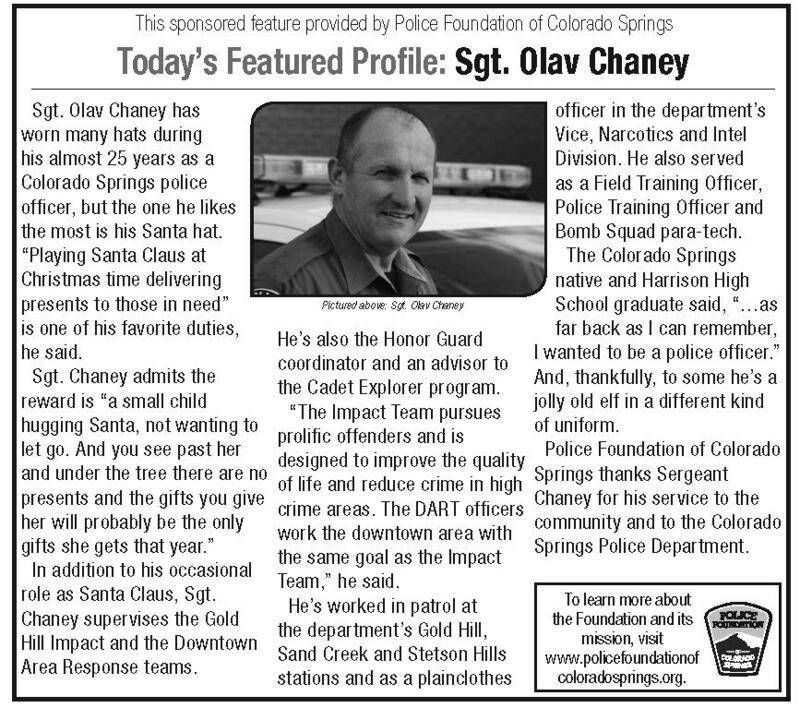 Learn more about how the Colorado Springs native serves the department and his community. This profile appeared Sept. 9, 2015. 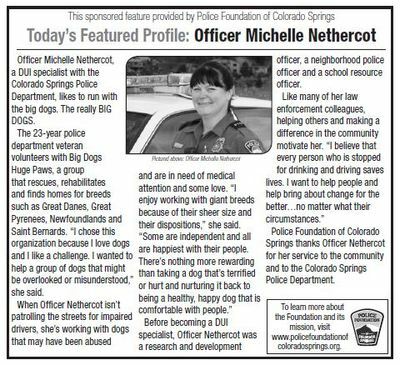 Officer Michelle Nethercot likes to run with the big dogs. The really BIG DOGS. When shes not on the roads looking for impaired drivers, she's volunteering with Big Dogs Huge Paws. This profile appeared Sept. 23, 2015. Sgt. Ron Sheppard is an Army veteran and has been a police officer in Colorado Springs for 24 years. He supervises the 12-member Tactical Enforcement Unit. This profile appeared Oct. 7, 2015. 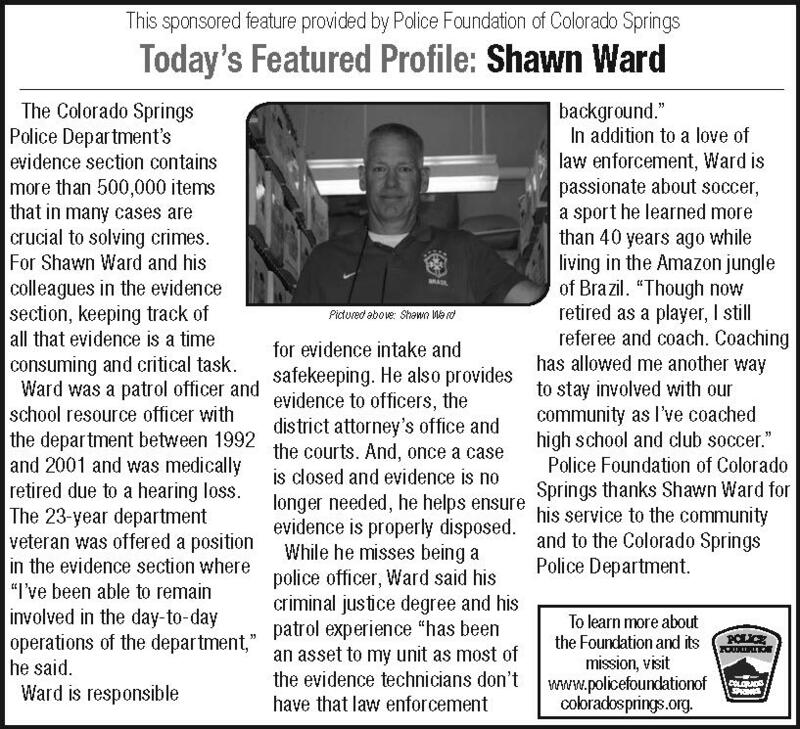 Shawn Ward and his colleagues are responsible for keeping track of more than 500,000 pieces of evidence for the Colorado Springs Police Department. He also learned to play soccer while living in the Amazon jungle of Brazil. This profile appeared Oct. 21, 2015. 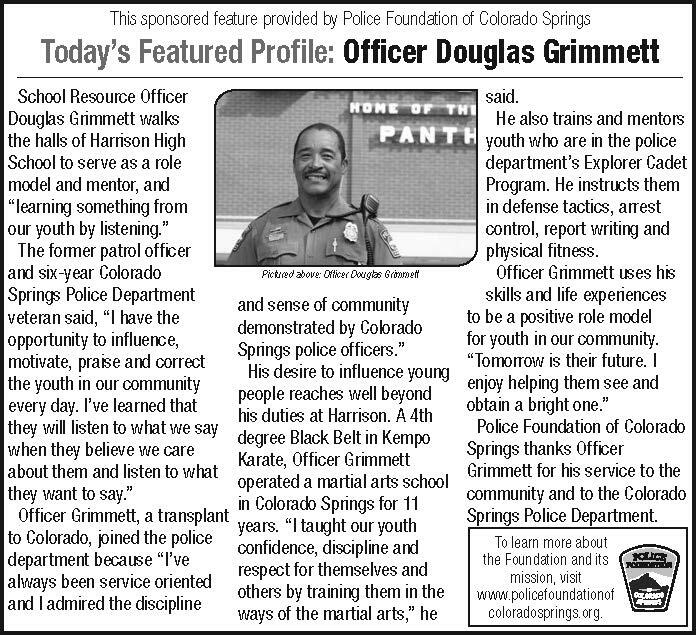 Officer Douglas Grimmett, Harrison High School Resource Officer, serves as a role model and mentor to students, and spends time teaching youth who serve the community through the police department's Explorer Cadet Program. This profile appeared Nov. 4, 2015. 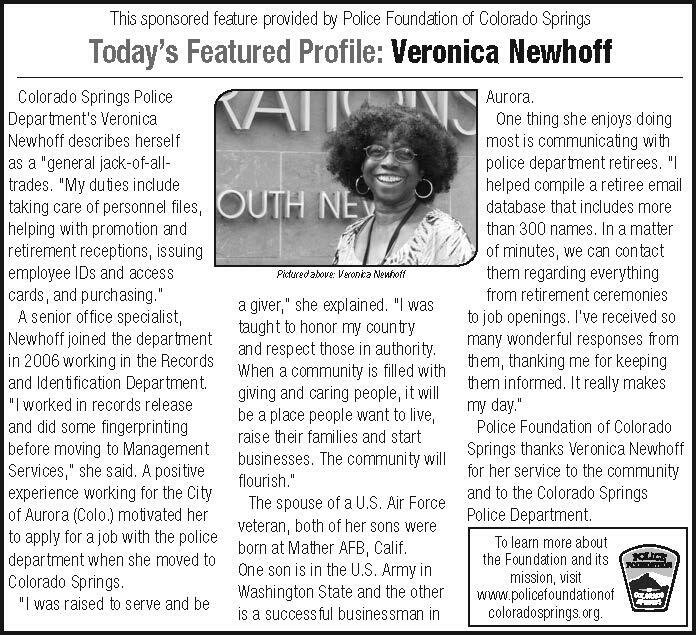 Veronica Newhoff was raised to serve and to give back to her community. The self-described "Jack-of-all-trades" is a senior office specialist with the Colorado Springs Police Department who revels in staying in touch with retired police officers. This profile appeared Nov. 18, 2015. Sgt. 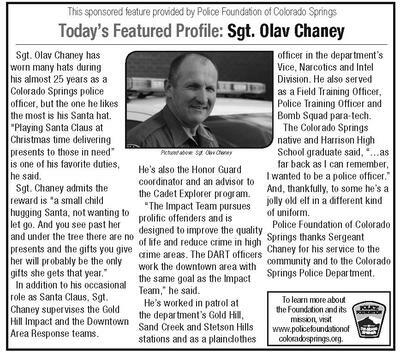 Olav Chaney has served the Colorado Springs community for almost 25 years as a police officer, but his favorite role is playing Santa Claus for underpriviledged children in the Pikes Peak region. This profile appeared Dec. 2, 2015. 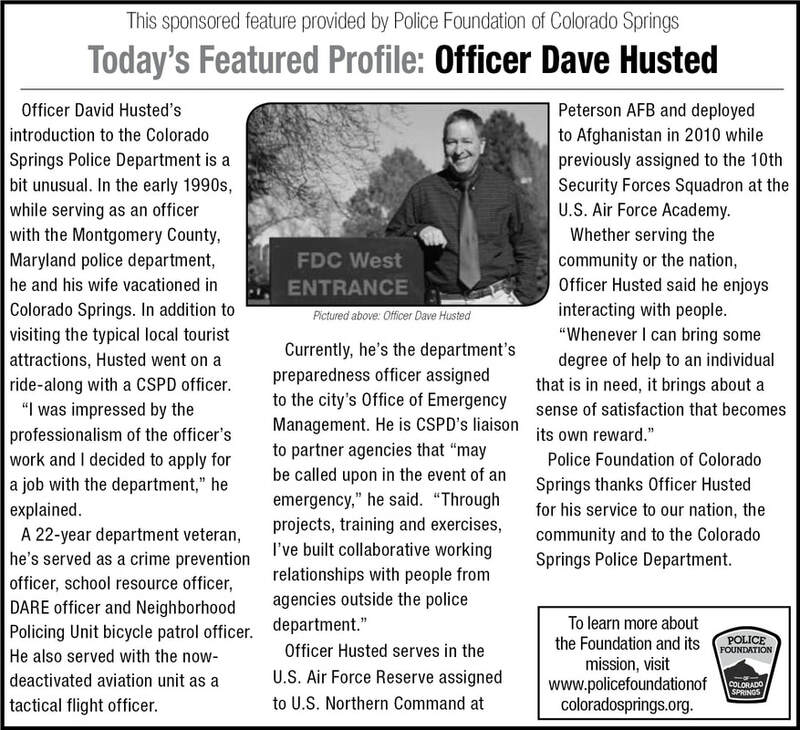 Officer Dave Husted's introduction to the Colorado Springs Police Department is a bit unusual, but has resulted in a long and varied career for the dedicated law enforcement professional. This profile appeared Dec. 16, 2015. 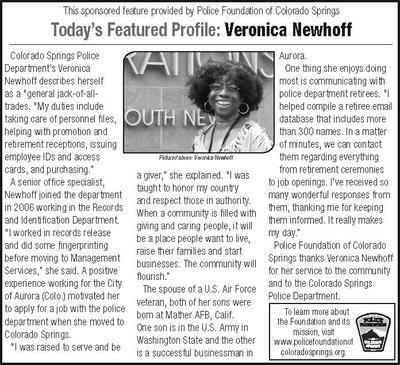 Vanessa Jones, a Community Service Officer at the Colorado Springs Police Department's Gold Hill Station, transitioned from a desk job of 15 years to supporting sworn officers in the field. This profile appeared Dec. 30, 2015. 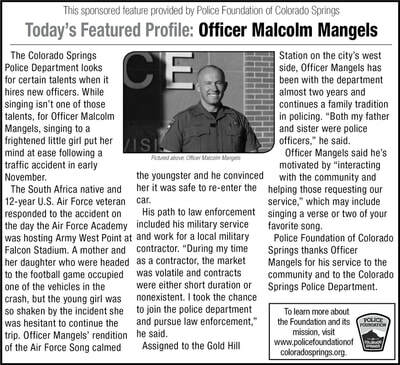 Officer Malcolm Mangels, a U.S. Air Force veteran, sang a special song to soothe a little girl's nerves after she was involved in a car crash on her way to the Air Force-Army West Point football game last November. This profile appeared Jan. 13, 2016. 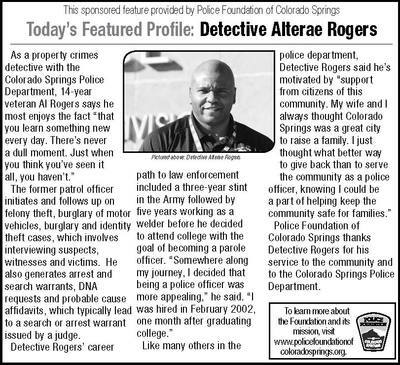 Detective Al Rogers, a 14-year Colorado Springs Police Department veteran, investigates property crimes out of the Sand Creek Station in the eastern section of the city. The Army veteran worked as a welder for five years before entering law enforcement. This profile appeared Jan. 27, 2016. 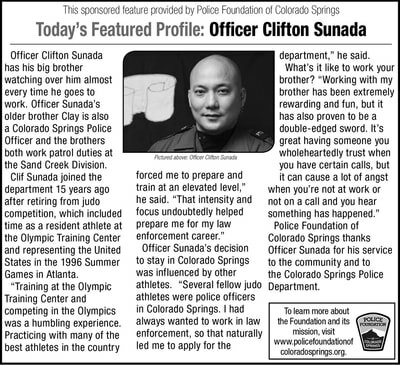 Officer Clifton Sunada represented the United States in the 1996 Summer Olympic Games in Atlanta. 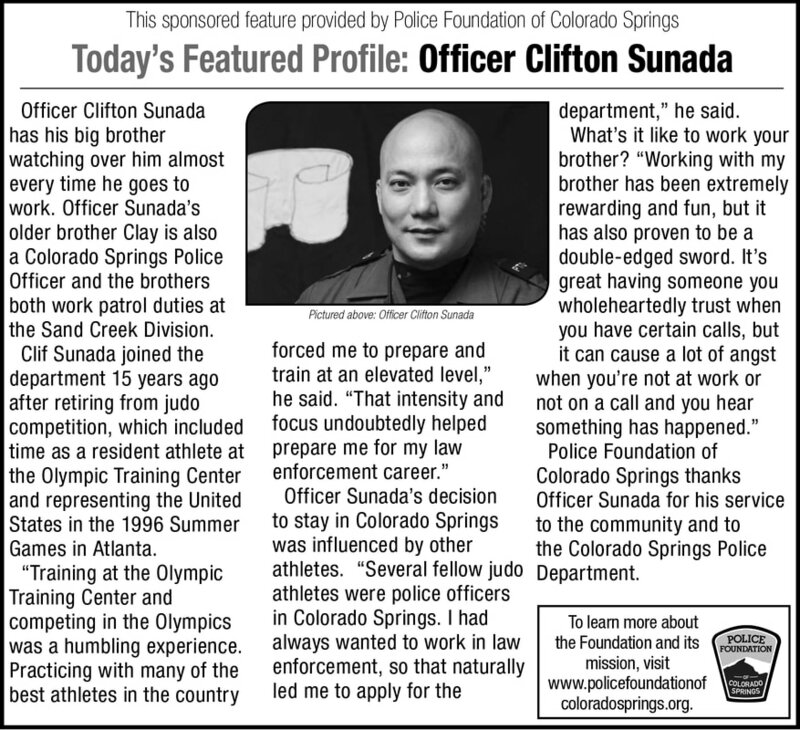 He attributes his dedication to the police department and the community to his Olympic training and some special teammates. This profile appeared Feb. 10, 2016. 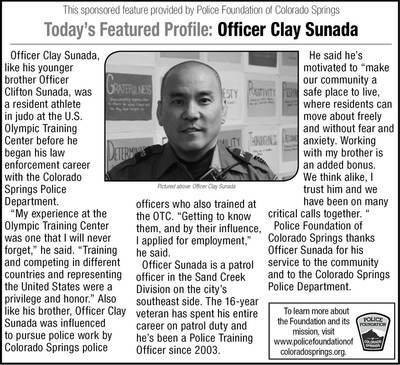 Officer Clay Sunada, like his younger brother Clifton, trained at the U.S. Olympic Training Center in Colorado Springs before joining the police department. 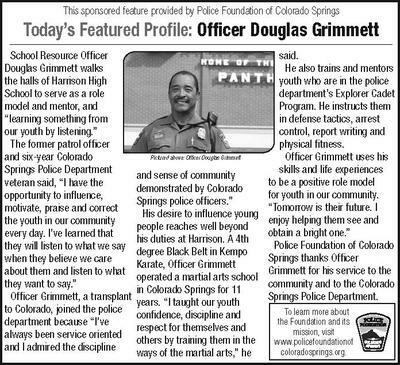 He, too, was influenced to enter law enforcement by fellow trainees who were police officers. This profile appeared Feb. 24, 2016. Detective Terry Thrumston has spent more than a decade investigating crimes against children. She said she's motivated by "the smile I see on those innocent faces when I know they're in a safe place..." This profile appeared March 9, 2016. 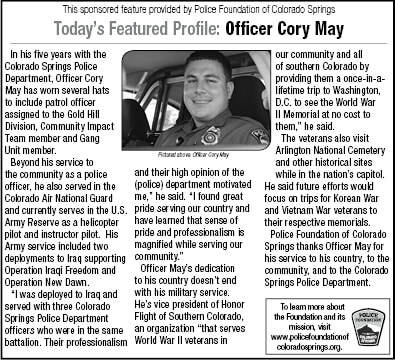 Officer Cory May has served his community for five years as a police officer, but he also serves his country as a helicopter pilot and as an instructor pilot with the U.S. Army Reserve, which includes two tours in Iraq. This profile appeared March 23, 2016. 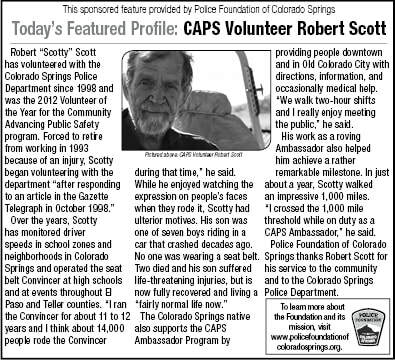 Robert "Scotty" Scott has volunteered with the Colorado Springs Police Department for almost 20 years. The retiree reached a remarkable milestone while working as a CAPS Ambassador in 2015. This profile appeared April 6, 2016. 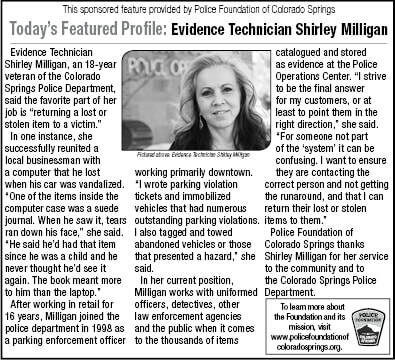 Evidence Technician Shirley Milligan strives to be the final answer for her customers, or point them in the right direction. 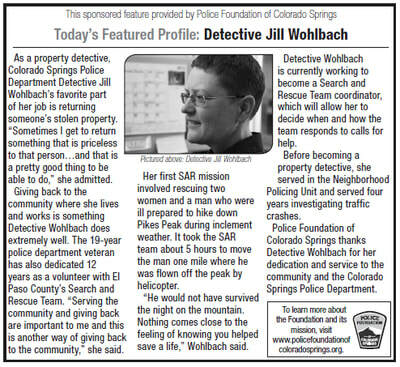 She also loves returning lost or stolen items to a victim. This profile appeared April 20, 2016. Tactical Officer Teresa Tomczyk wanted a career that would get her out of the office setting and that wasn't mundane. The 11-year police department veteran is only the second woman to serve with the elite Tactical Enforcement Unit. This profile appeared May 4, 2016. 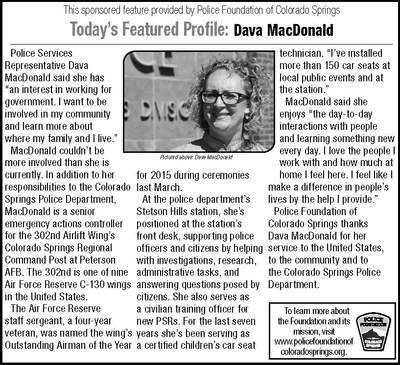 Public Service Representative Dava MacDonald couldn't be more involved in the community. In addition to her responsibilities with the Colorado Springs Police Department, she serves as a senior emergency actions controller in the Air Force Reserve at Peterson Air Force Base. This profile appeared May 18, 2016. 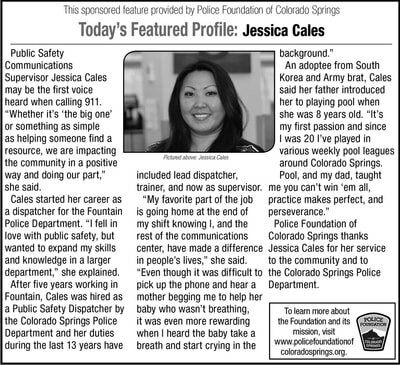 Public Safety Communications Supervisor Jessica Cales may be the first voice heard when calling 911. “Whether it’s ‘the big one’ or something as simple as helping someone find a resource, we are impacting the community in a positive way and doing our part,” she said. This profile appeared June 3, 2016. Officer Bernie Bañuelos' main focus is keeping the channels communication open between the police department and the public. The Colorado Springs Police Department's Community Relations Officer's job keeps him front and center when it comes to interacting with the community. This profile appeared June 15, 2016. 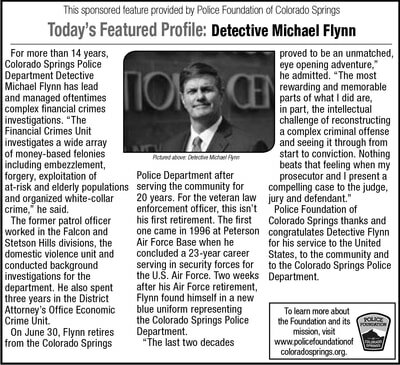 Detective Michael Flynn spent the majority of his law enforcement career investigating financial crimes, including embezzlement, forgery and a host of other financial misdeeds. 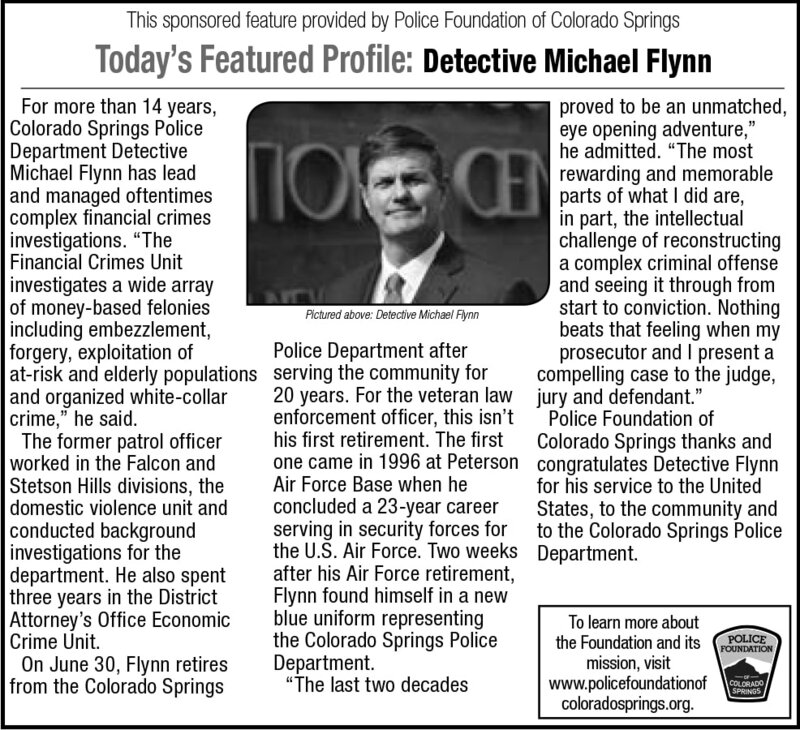 Flynn joined CSPD two weeks after he completed a 23-year career in the Air Force. This profile appeared June 29, 2016. 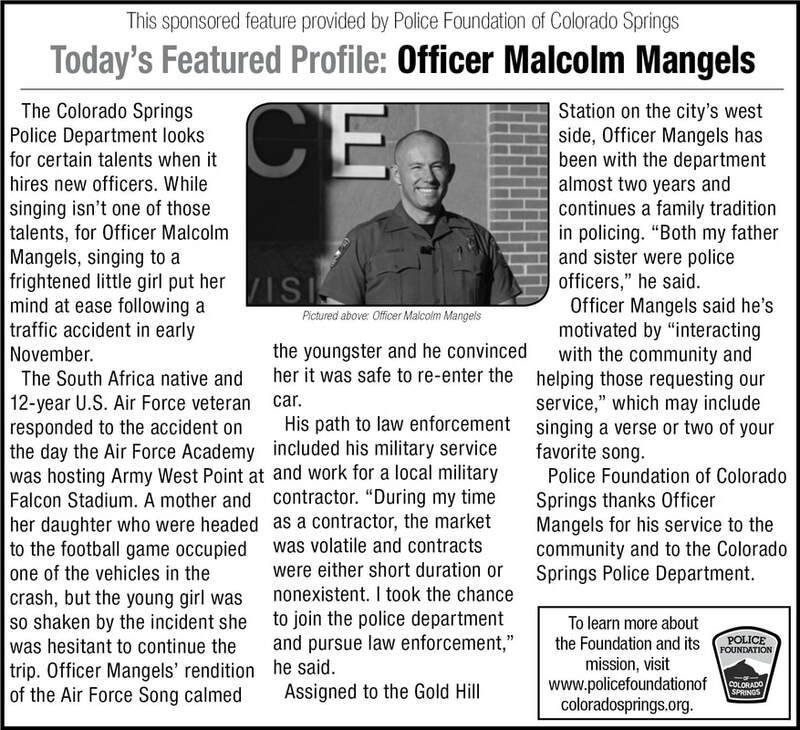 Officer James E. Allen has worn many hats as a Colorado Springs police officer, but one of his greatest accomplishments came recently when he was honored for his service as a soldier in the Colorado National Guard. This profile appeared July 13, 2016. 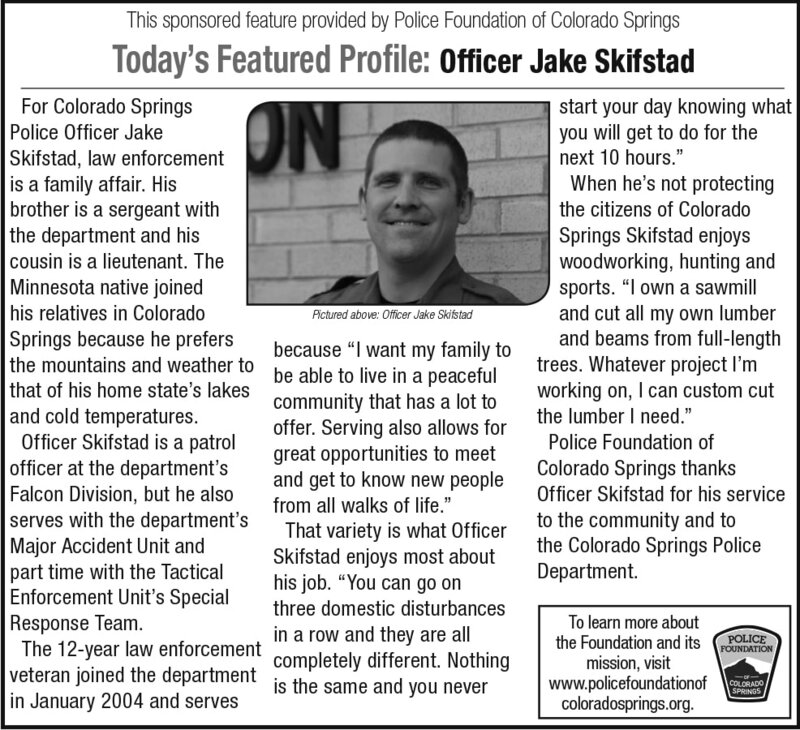 Officer Jake Skifstad, a Minnesota native, prefers Colorado's mountains and weather to that of his home state's cold temperatures and lakes. 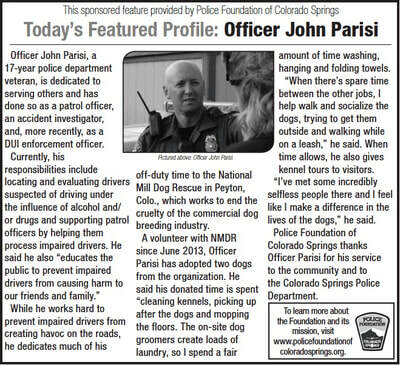 Besides, he's able to work with both his brother and cousin, both Colorado Springs police officers. This profile appeared July 27, 2016. Sgt. 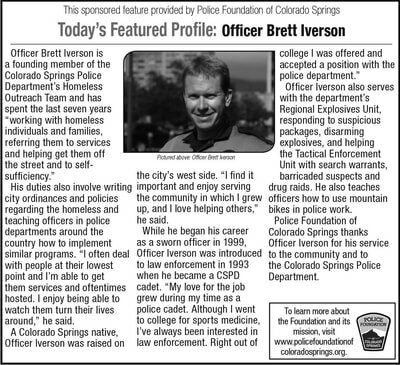 Brett Iverson is a founding member of the Colorado Springs Police Department's Homeless Outreach Team and works tirelessly on the behalf of those struggling on the streets. This profile appeared Aug. 10, 2016. 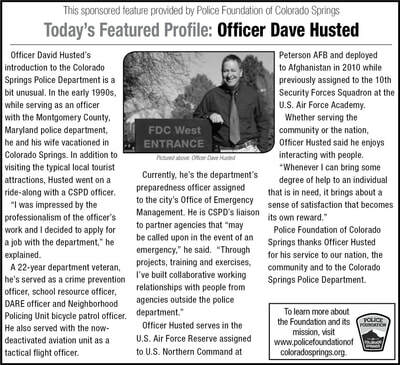 Lt. David Edmondson, a 20-year veteran of the Colorado Springs Police Department, represented the United States in international shooting competitions for 14 years. While he narrowly missed a chance to compete in the 1992 Summer Olympic Games, he did compete in Guatemala, Russia and Cuba. This profile appeared Aug. 24, 2016. Officer Julie Garrett recently earned her Doctorate of Management Degree in Homeland Security, making the 25-year police department veteran the only officer who can be called doctor. She was also the department's first female motorcycle officer. This profile appeared Sept. 7, 2016. 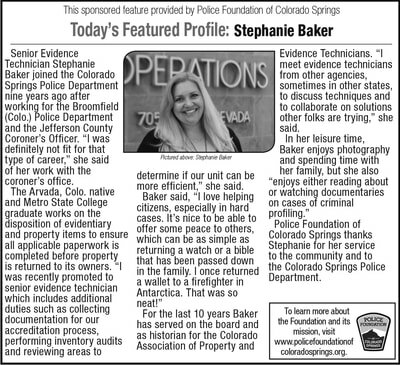 Senior Evidence Technician Stephanie Baker worked briefly for the Jefferson County (Colo.) Coroner's Office, but said, "I was definitely not fit for that type of career." 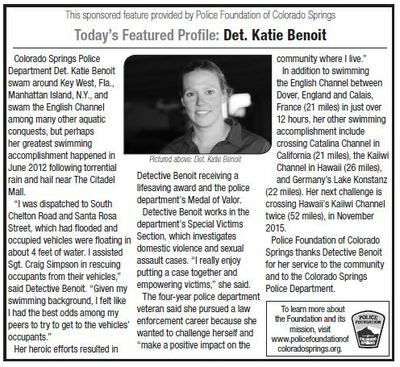 The Arvada native has found her niche and made her mark on the Colorado Springs Police Department. This profile appeared Sept. 21, 2016. 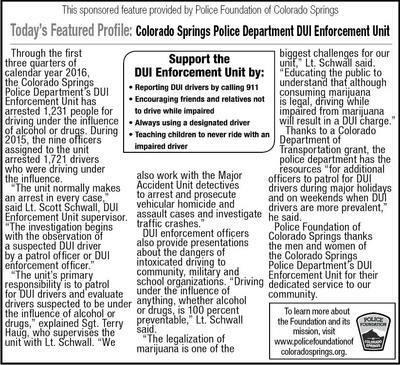 The Colorado Springs Police Department's Robbery Unit investigates about 200 of the 500 cases it reviews each year. 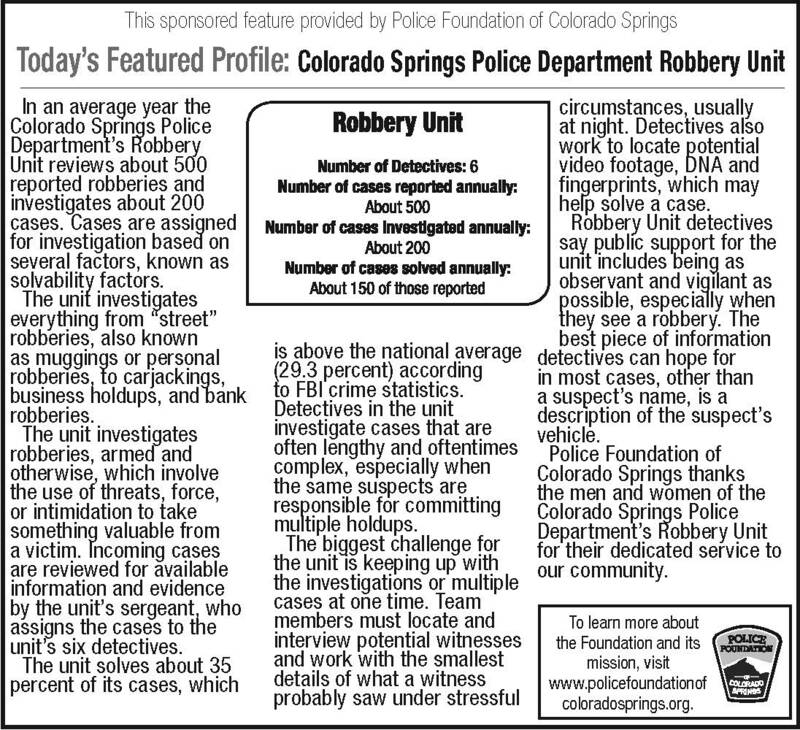 The unit's six detectives solve about 35 percent of the cases, which is higher than the national average, according to FBI statistics. This profile appeared Oct. 19, 2016. 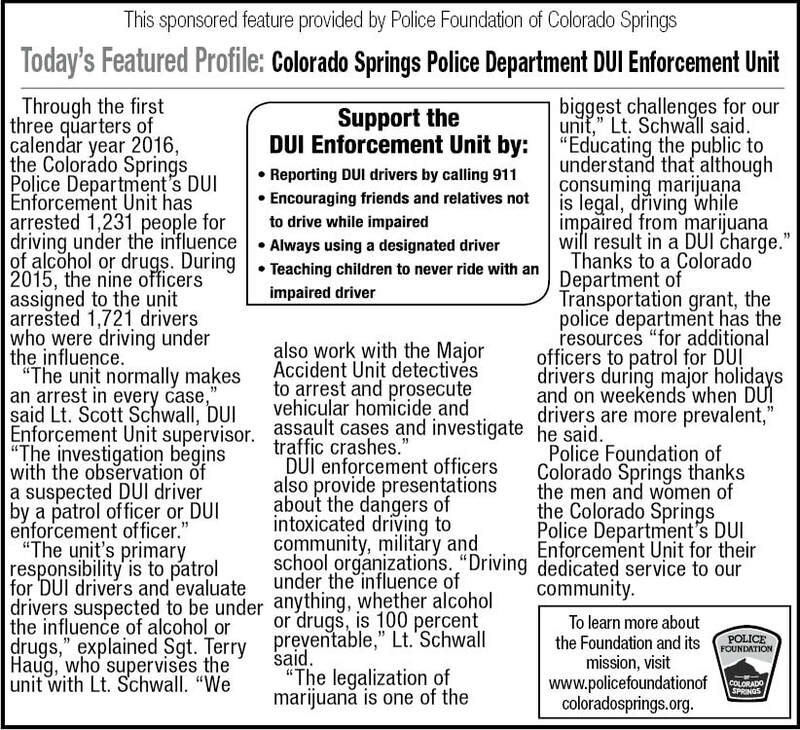 Patrolling the streets and highways in Colorado Springs for impaired drivers is the responsiblity of the police department's DUI Enforcement Unit. 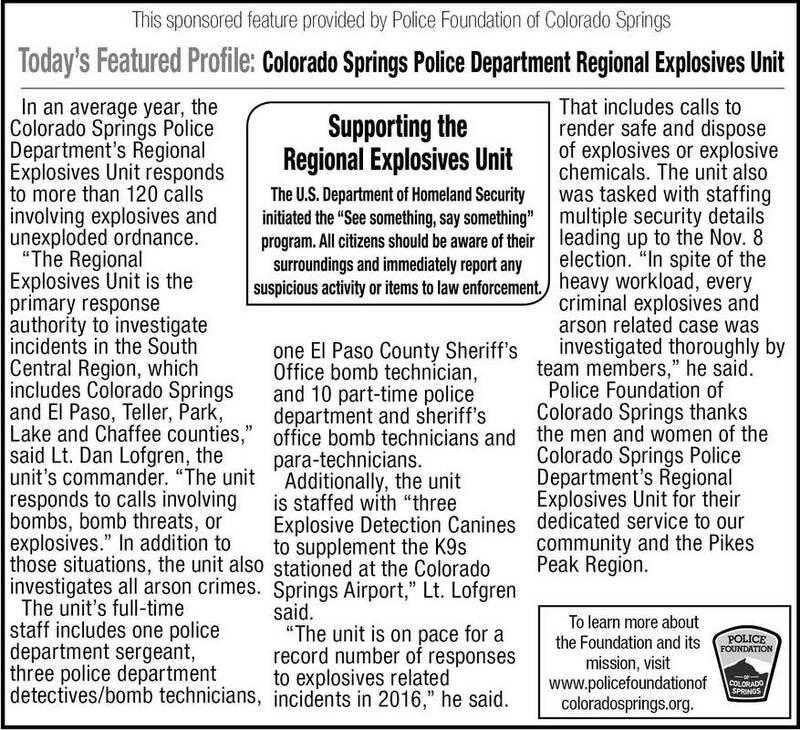 Learn more about the unit's work and the challenges its officers face. This profile appeared Nov. 2, 2016. 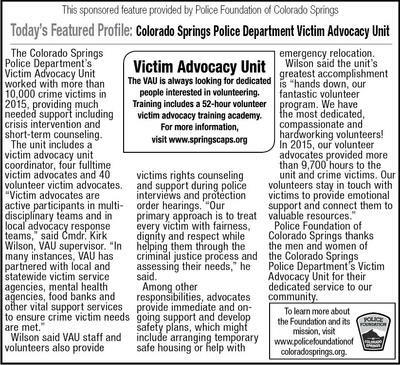 With more than 40 volunteer victim advocates, the Colorado Springs Police Department's Victim Advocacy Unit supported more than 10,000 crime victims in 2015. 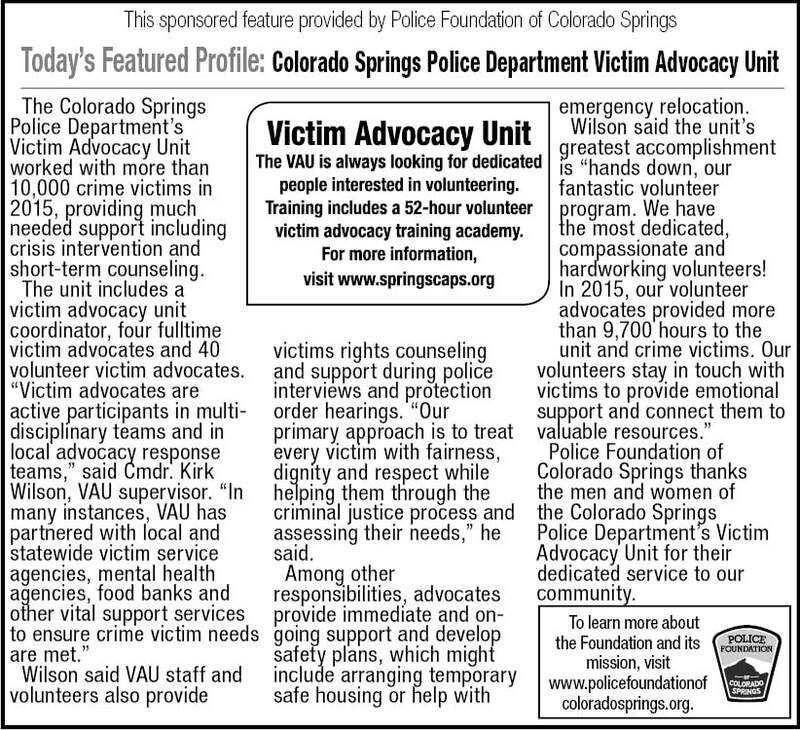 Volunteers provided more than 9,700 hours to the unit and crime victims last year. This profile appeared Nov. 16, 2016. 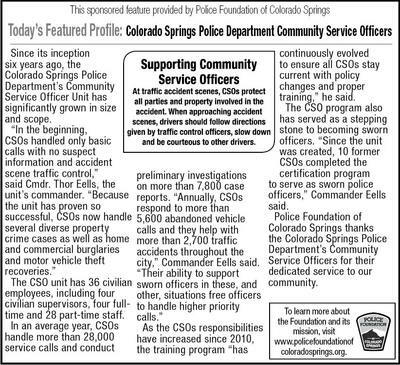 Since its inception six years ago, the Colorado Springs Police Department's Community Service Officer Unit has grown to include 36 full- and part-time staff. 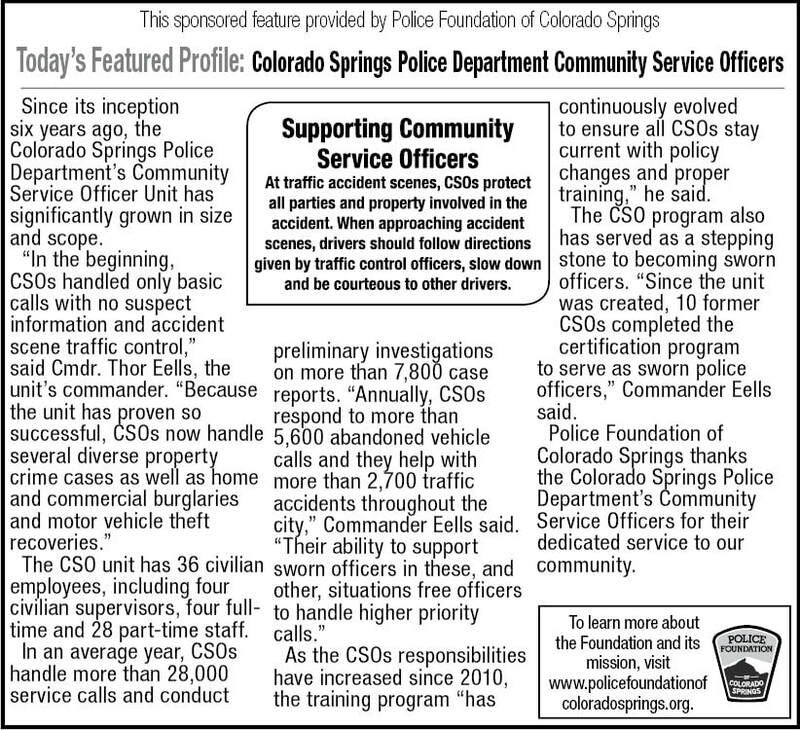 Learn how CSOs free sworn officers to handle higher priority calls. This profile appeared Dec. 7, 2016. 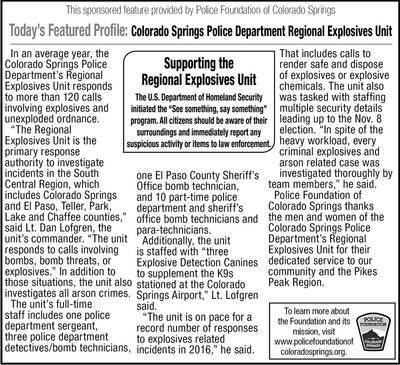 The Colorado Springs Police Department's Regional Explosives Unit responds to incidents throughout a large segment of south central Colorado. In addition to bombs and bomb threats, the unit also investigates all arson crimes. This profile appeared Dec. 21, 2016.